I usually make a blueberry infused spirit, but it seemed time to expand my blueberry horizons by making a liqueur. I’m glad I did. It wasn’t hard at all and only took a little patience. A lot of the blueberry liqueur recipes I’ve seen use lemon zest and clove. I chose to bypass those ingredients. I wanted to isolate the blueberry flavor for my cocktails and didn’t want to be married to the clove and citrus tones. You may want to give them a whirl though. I haven’t had a chance to try out other berries yet. I’m sure they’d work too. If anyone has any success stories with alternate berries please let me know. I know you aren’t going to believe me when I say this, but it’s true. This recipe works best with frozen blueberries. The organic breakdown of frozen fruit makes the flavors pop. When frozen the water crystallization disintegrates the plant cells on microscopic cellular level. You’re just going to have to trust me on this one. When it’s all said and done, this recipe will yield two 50 proof, 750 ml bottles of blueberry liqueur that are very versatile. You can use it in cocktails, drizzle it over your favorite desserts (blueberry crumble, vanilla ice cream with fresh berries, etc), add depth to sauces and marinades, or just plain sip it after a meal. Lightly cook the blueberries to release their natural sugars. Add the blueberries and vodka to a 2 quart, widemouth canning jar and wait 1–2 months. I thought it was acceptable at 1 month, but was better at two. It’s up to you how patient you can be. Strain the blueberries from the vodka. Dissolve the 5 cups of sugar in the 750 ml of water and then incorporate it with the vodka. Adjust your sugar levels to taste. Bottle your blueberry liqueur. It should keep for a couple years due to the alcohol. Added bonus, it will get better over the first couple months. 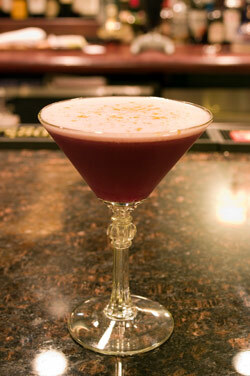 Try your new blueberry liqueur in an alteration of my Blueberry Hill cocktail recipe. Add all ingredients in a cocktail shaker. Dry shake or use a handheld frother to incorporate the egg white. Add ice and shake. Strain into a chilled cocktail glass. 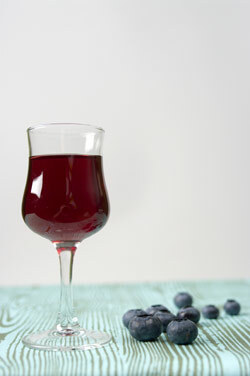 Garnish with fresh blueberries or rim your glass or top with a sugar and dehydrated blueberry power combination. I could imagine using this with cooking of game meat. Seems very versatile. I was thinking the same thing. What’s your thoughts on a recipe? Ouh– homemade liqueur! Need to jump on that bandwagon. As far as game meats, this might pair well with some venison. Thanks for stopping by my blog and introducing me to yours. Best! Venison sounds like a winner. Your blog has some tasty recipes. I could not resist. Duck is another option I could see. The sweetness of the blueberry could be good with the richness of the duck. You were right, this liquor would be a divine companion to my my Blueberry Sour Cream Ice cream. Thanks for stopping by my blog so I got to discover yours as well. Man, that ice cream.… I need to have some of that! If I only have access to 80 proof vodka, could this still work? Yes. Just taste the infusion along the way until it’s to your liking. I followed your recommendations for using frozen blueberries and cooking them a touch, and then made a blueberry gin with spices and citrus. It turned out great. Thanks for your awesome DIY booze ideas! This looks amazing, Josh! I think next time I make an infusion…gonna be a next time, yeah…I’ll try the frozen blueberries for the gin and this liqueur. I think this would be amazing in a blueberry pie or any berry pie. I’ve used frambroise, but this, well, it’s a whole new level! I’ll be posting a recipe for cherry gastrique here soon. I bet you could use that in something. Endless opportunities. would you say that this recipe work with pretty much every other fruit? I can tell you it works for blackberries and raspberries, if that helps! Do you refrigerate the blueberries and vodka during the 2 months? Sheryl, I did not refrigerate the infusion but keep it away from a sunny window. What do you mean by lightly cooking the berries? Slightly sweet them in a pan so they open up. The skins otherwise are tough and it takes longer for them to infuse. I make this with blackberries and elderberries — they turn out great! I have yet to try blueberries, but I have a few bags in the freezer so that will be next weekend’s fun. Elderberries and Blackberries mixed together or separate? how long do you cook the blueberries for? I am trying to figure out a recipe with the blueberry liqueur and meat, but my imagination can only take me so far. Any suggestions you can give me? While this is an old post, I figure it’s worth commenting for the benefit of anyone else who might stumble across this post while searching for information about making liqueurs. I’ve been making them for a few years, and yes, other berries work quite well! And as you said, starting with frozen fruit is almost always best for these recipes. Raspberry is absolutely divine. Blackberry, cranberry, and cherry also work very well. Strawberry often isn’t worth the effort unless you can get really, really ripe berries without a hint of white in them (the flavor just doesn’t transfer well). Pineapple is marvelous, and I’ve found that with some brands of frozen pineapple, the infusion is complete in just a week or two (though it still needs to age a month or two after sugaring). A liqueur infused with cinnamon, nutmeg, and clove makes a lovely addition to cider (hard or not), mulled wine, and other wintery drinks. And you aren’t wedded to just white cane sugar for sweetening your liqueur! Maple syrup, agave nectar, caramel (the “boil sugar until it browns” kind), even molasses can be delightful. With tart fruits, splenda, stevia, and other zero calorie sweeteners can sometimes work. (I figured this out when my diabetic mother begged me to find a way to reduce the carbohydrate load from enormous to just huge, hahah) As far as quantities go, I don’t really measure much — I generally fill a mason jar nearly to the top without packing in the fruit, then top it off with vodka. If the flavor isn’t strong enough in a month or two, strain out the fruit, add another batch to the jar, and let it go for a few more months. And finally, for those just starting out and looking for a way to cut costs, the quality of your starting spirit definitely matters. You don’t need top shelf vodka by any means, but anything below, say, Smirnoff or Svedka (often avaliable inexpensively in large quantities at your local Costco!) is going to compromise the quality of your finished liqueur. Have fun!